Be Careful When Your HOA Tows Vehicles; Towing Can Have Deadly Results! 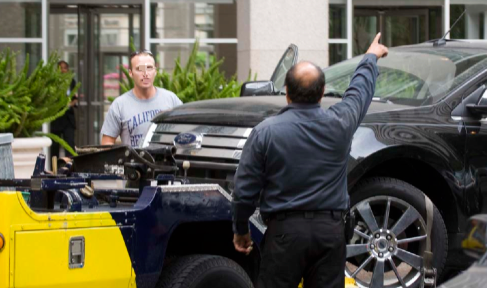 In California, condo/HOA associations have the right to tow so long as they comply with the law. But sometimes, associations can be too zealous. I was just referred to an article about such a situation in Florida. After a dispute with the tow truck driver, this owner was apparently run over by his own car as it was being towed away. This owner, a married father of three, a professor and associate dean at the local university, came home and found that his autistic son’s tutor was parked in the second spot in his driveway. So he pulled in behind, with his car protruding onto the sidewalk and swale area. Apparently, at the owner’s community association where he lived, that was a towable offense. The association is made up of homes jammed together, and there is no street parking. The homeowners association had a contract with a towing company to tow parking violators. Apparently, the tow company zealously performed its job, with some residents reporting that its tow trucks roamed the area looking for cars to tow. No one had complained about the owner’s parked car, it had not been cited by the association, and it was not blocking a marked fire lane. Of course, while the association can be faulted for hiring and allowing an overzealous towing company to unilaterally decide when and if to tow cars, which we do not believe are good ideas, there is also the issue of the owner and his actions. The tow truck driver said the owner had hopped on the running board of his tow truck and banged on the window. Then he either jumped or fell off. What does this story tell California community associations? Several things: Do not tow unless the car is creating a safety issue, such as being parked in a marked fire lane or the car belongs to a serial parking rule violator who has been cited, called to hearings and fined and still violates the parking rules; instruct the towing service to release a car if the owner shows up; and review the parking rules to make sure they are reasonable and have a rational purpose.